May | 2008 | Ding! Many people have suggested that their creativity has been enhanced by ingesting mind and body altering chemicals. Let’s have a brief look at some of the most common. The most popular drug in use today is alcohol. Acclaimed for its supposed social skills enhancing powers it actually does the opposite. Users believe themselves to be articulate, decisive and responsive but in reality the drug is a depressant which saps joy and reduces rational and creative thought as well as limiting vocabulary. Any positive affects can actually be assigned to the simple fact of groups of friends getting together to talk. Although fast becoming a social anathema, nicotine inhaled from smoldering tobacco leaves was thought to be useful to aide relaxation and thoughtfulness. In fact, nicotine acts as a stimulant. Because of the addictive nature of the drug, the stimulation only brings the user back up to the level they were at before initial use. The positive effects of the drug can be ascribed to taking breaks, breathing slowing and deeply and stepping outside for a short time. All of these are better done without the inhalation of carcinogenic particulates. Tetrahydrocannabinol is a psychoactive chemical inhaled from burnt cannabis sativa plants. It works as an anesthetic, counteracting tics, seizures and spasms by numbing the nervous system. Although the effects are a stress-free relaxed state, the drug is linked to memory loss and loss of cognitive function which prevents the user from getting anything worthwhile done. The temporary increased euphoria from ingesting cocaine desensitizes the brains neurons’ feel-good neurotransmitters, reducing levels of joy as well as causing irregularities in heart beat and paranoia. It also increases levels of arrogance. There are no discernible benefits that can’t be replicated by just doing something exciting. Albert Hoffman was a Swiss chemist who died last month aged 102. In 1938 he created the psychedelic drug LSD. A tiny amount of the crystal causes heightened senses and synesthesia (switching of the senses), dream-like perceptual changes and a holistic viewpoint of the world. Although non-toxic it can trigger latent psychosis and makes the user more prone to accidents. Few users could claim to being creative while on a ‘trip’, their creations were made some time afterwards. Any experience can inspire great works. The same effect can be achieved by meditation, religion or simply physically going on a trip. To summarise, try these cheaper, safer and legal methods instead: meet up with friends to discuss ideas, relax, get some fresh air, get excited, meditate, explore what you believe in, do something different and change your state of mind from within. 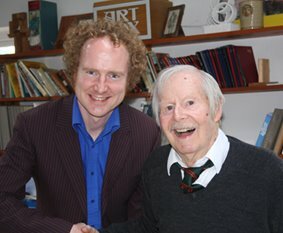 This month I finally got to meet one of my heroes, the artist, broadcaster and double BAFTA winning Tony Hart. I never did send any of my pictures to the Gallery (to be shown on the programme), one of the few things I always regreted (not writing to ‘Jim’ll Fix it’ was another), so finally meeting the man and seeing the studio where he thought up all his techniques was a great honour. Tony was also kind enough to write the forward for my new book which details how everyone can begin and progress on their creative journey. It’ll be out very soon. Visit Tony’s website here. Here’s a clip from the first episode of Take Hart from 1977.